Very much like their 6” Ghostbusters figures Mattel chose to use the same packaging for each of its Retro-Action The Real Ghostbusters. The thin, flexible like card is a throwback to the packaging Kenner created for The Real Ghostbusters figures during the 1980s. I like how they mixed it up with introducing the guys. Instead of the line up I’ve been using since I first saw Ghostbusters at 6. Peter, Ray, Egon, and Winston. I can picture a Matty Collector team discussing the personalities and skills of each The Real Ghostbuster. Or they could have taken a vote over their favorites. Curious they chose to picture just about everyone’s favorite #1 “ghost,” Mr. Stay-Puft over Slimer. I love the big marshmallow guy, Janine should have been on the cards. At the time Matty Collector included her in a group picture on the back of the cards. 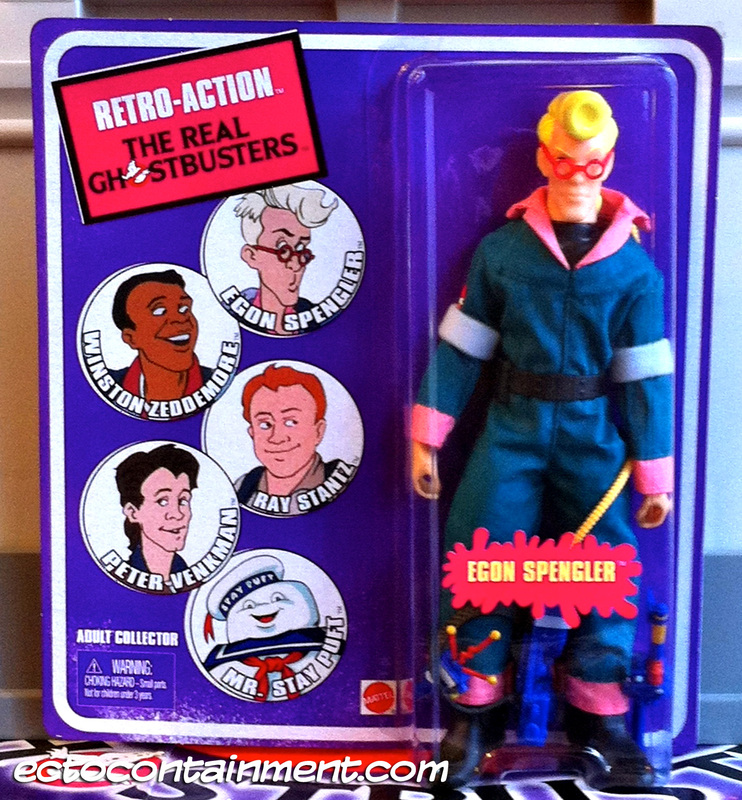 Each Retro-Action The Real Ghostbusters has mostly real clothing compared to the painted Kenner The Real Ghostbusters hero figures. This is how figures from toy companies like Mego and Kenner were during the 1970s. The only part of the clothing that isn’t a material is the undershirt. The torso on the Retro-Action figures are painted black. To make each Retro-Action The Real Ghostbuster unique and a reason for a fan to buy each figure Mattel included different accessories for most of the line. Every Retro-Action The Real Ghostbuster comes with a The Real Ghostbusters style proton pack. I say style because the look of these accessory packs aren’t 100% to their cartoon counter part. A The Real Ghostbusters proton pack has three cyclotron lights, not just two. For some reason instead of basing a “Retro Action” proton pack on their look from The Real Ghostbusters Mattel chose to design the pack after the toy version from Kenner. Perhaps this was in tribute and in respect to Kenner who had the license to make the original hero figures. Egon also comes with his unique accessory, a P.K.E Meter. An accessory that didn’t come with the original Kenner hero figures. In 1989 Kenner released their Screaming Hero figures. Screaming Hero Egon came with a P.K.E Meter. As any hero figures were creatively different after 1986 Kenner’s creativity extended to the accessories. The Screaming Heroes P.K.E Meter was yellow and looked like the antenna could be raised if it had been real. Everyone knows Egon is the PKE master, it only makes sense this is his and his accessory alone. Only thing is The Real Ghostbusters P.K.E Meter didn’t look like this. The antenna Mattel went with is based on Kenner’s version. I realize my retro action P.K.E Meter is backwards in its packaging.